Last month I cried unto God over the situation of poor, weak, neglected and abandoned sick patients in a hospital in Owerri. My attention was first drawn to a woman, who was 'detained' in the medical facilities for inability to pay her hospital bills for a period of 4months after she got discharged. The day I went to rescue her through donation from good spirited individuals, I couldn't hold my tears, more than 15 of her likes are equally detained in the hospital. I couldn’t believe it, I enquired from the Hospital management and was told, the Hospital was a specialist Hospital, most of their cases are emergency referrals from smaller hospitals, maternity and other medical and diagnostic center, who doesn't have specialist or equipment to handle. That their first priority was to save life. It happened that after patients were treated and discharged, they couldn't afford to pay medical bills, and if allowed to go, and be paying gradually. They will completely disappear. To checkmate it, they were not allowed to leave the perimeter of the medical facility until their outstanding bills are settled. I saw it a big challenge that needs a quick solution. My spirit couldn't rest, I outlined a medical outreach program; reaching out to friends, Facebook followers and readers by publishing the pitiable situation of the patients that needs help here on Facebook. In less than one week, three were paid for and allowed to go home peacefully, also through the support from good spirited individuals. I continue reaching out to friends who promised to do something. But today, God manifested himself in a very special way. Someone I have not seen or met before read the post on my Facebook wall, called me from Lagos state, I explained to her. She said the NGO she works for (Good Light Foundation), is interested in bringing smile in the faces of those indigent patients. All I could say is wow! She followed it, how much is their bills, I told her; the major people with huge bill is N1.072, 500. 00 and the one God has chosen, Mrs Evan Chioma Ulokwe Duru representing Good Light Foundation said no problem, that she is taking the next available flight to Owerri from Lagos. In less than one hour she was at Imo Airport. I picked her up and few members of the Good Light Foundation and we drove to the New Creation Hospital Orji, Owerri North LGA of Imo State. She was overwhelmed by what she saw. 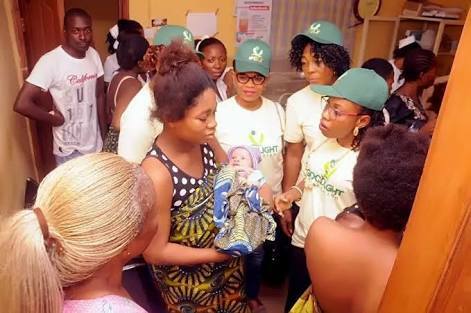 She out of human kindness increased the number of patients to ten (10) including three nursing mothers, bring the amount to N1. 2 million (One Million two hundred thousand naira). A total of ten patients were paid for and allowed to go home happily to rejoin their families. I was overwhelmed, I can't thank Mrs Chioma Duru enough, I can't thank the founder and President of GOOD LIGHT FOUNDATION, Sir Stanley Amuchie, an entrepreneur from Aboh Mbaise local government Area of Imo State enough. What a wonderful soul, doing great things in propagation of God’s kingdom on earth, through service to humanity. My joy is complete. Please Join me to rejoice because there is celebration in heaven right now!!! Names of Patients their bills were paid for and their LGA. I can't just thank him enough, I praise his name always. His name is the Almighty Jehovah.